Does more “extreme” content compel the most compulsive viewing, or are we only concerned with compulsive viewing when the content has antisocial overtones? In other words, when YouTube fine-tunes its algorithms, is it trying to end compulsive viewing, or is it merely trying to make people compulsively watch nicer things? … The idea that YouTube shouldn’t force-feed users content at all is, of course, not considered. The assumption built into YouTube (and Netflix and Spotify and TikTok and all the other streaming platforms that queue more content automatically) is that users want to consume flow, not particular items of content. Flow and not content secures an audience to broker to advertisers. … [The compulsivity of flow] is so pervasive as to almost seem inescapable — from “page-turners” to bingeable shows to endlessly refreshable scrolls to autoplaying music and autopopulating playlists. It is usually depicted as a selling point, a proof of quality — you can’t put it down! — but that shouldn’t disguise the fact that what’s being sold is surrender: Engage with this thing so you can stop worrying about what to engage with. That is flow. … Flow allows us to experience our agency without exactly exercising it. It blurs the lines between those things. Flow, fundamentally, is a trap — as anthropologist Nick Seaver details, that means it is a “persuasive technology” that can condition prey “to play the role scripted for it in its design.” Traps work, he argues, by making coercion appear as persuasion: Animals aren’t forced into the trap; its design makes them choose it. Coercion and persuasion, then, can’t be cleanly distinguished. … We are neither forced to consume more nor choosing to consume more; we both want the particular units of content and are indifferent to them. We are both active agents and passive objects. … Flow works by disguising its compulsory mechanism in the details of its content, which is nothing more than bait from the system’s perspective. [Are] certain kinds of content are especially suited to this blurring? How do we become addicted to the spectacle of our consumption, as an emblem of our own singularity? Does it take particular kinds of content? Does certain kinds of antisocial content make that spectacle more potent and compulsive? Does pursuing information that other people reject or that seems hidden or secret intrinsically make the pursuer aware of their own agency, of their ability to redraw the epistemic frame? We need to navigate complicated philosophical questions in order to decide how to act, what to do, what behaviors to incentivize, what behaviors to punish, what signals to send, and even how to have a society at all. Sometimes we can use theories from science and mathematics to explicitly model how a system works and what we want from it. But even the scholars who understand these insights rarely know exactly how to objectively apply them in the real world. Yet anyone who lives with others needs to be able to do these things; not just scholars but ordinary people, children, and even chimpanzees. So sometimes we use heuristics and approximations. 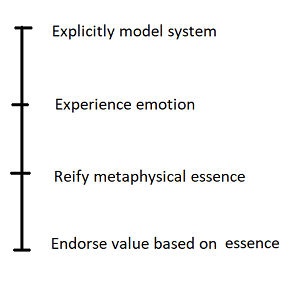 People can choose metaphysical heuristics or explicit models based on their own innate tendencies, their education, their intelligence, their experiences, and what kind of question we’re thinking about. Rather than talking too much about fundamental value differences, we should be asking where a given person has chosen to place themselves on the metaphysical-heuristic-to-explicit-model ladder at any particular moment. Since most metaphysical heuristics are a stand-in for something real, we should expect blocs of allied people to contain some people who want the real thing, and other people who are running metaphysical heuristics that point at the thing. My guess is a lot of people fluidly move back and forth between these levels, just as I would expect people who are very interested in only eating organic food to also be more likely to care about what percent RDA of vitamins are in their food. This isn’t sinister, or a reason to think that people are only claiming consequentialist arguments for their heuristics. It’s just a natural consequences of the way our values get produced and the fuzziness in everybody’s value system. What if journalists covered controversial issues differently — based on how humans actually behave when they are polarized and suspicious? … The idea is to revive complexity in a time of false simplicity. How did you come to have your political views? Haidt identifies six moral foundations that form the basis of political thought: care, fairness, liberty, loyalty, authority and sanctity. What is oversimplified about this issue? How has this conflict affected your life? What do you think the other side wants? What’s the question nobody is asking? listen not just to what [people] say — but to their “gap words,” or the things that they don’t say. listen for specific clues or “signposts,” which are usually symptoms of deeper, hidden meaning. Signposts include words like “always” or “never,” any sign of emotion, the use of metaphors, statements of identity, words that get repeated or any signs of confusion or ambiguity. When you hear one of these clues, identify it explicitly and ask for more. double check — give the person a distillation of what you thought they meant and see what they say. We sometimes think of political issues in binary terms. Is someone pro-life or pro-choice? But most individuals hold views that are more complicated than a binary can capture. An alternative is to describe a given position on a spectrum. On abortion, an outright ban sits at one extreme; at the other is the elimination of all restrictions on the procedure. In between are a staggering array of coherently distinguishable positions. There’s a different set of frames, though, that are as relevant as binaries and spectrums, though they are less familiar and less discussed: equilibriums and limits. Most political stances can be understood in terms of an equilibrium. For instance, some people might believe that access to abortion in a conservative state is too restricted under the status quo, and favor relaxing the rules regulating abortion clinics. That is, they might favor shifting the equilibrium in a “pro-choice” direction. But ask those same voters, “Should there be any limits on legal abortion?” and they might declare that the procedure should be banned in the last trimester of pregnancy unless the mother’s health is threatened. Insofar as the abortion debate is framed around the equilibrium, they will align with the pro-choice movement; but insofar as it is framed around limits, they will align with the pro-life movement. On abortion and scores of other political issues, there are people who tend to focus on equilibriums, other people who tend to focus on limits, and still others who vary in their focus. A single question put to the public cannot reveal the majority position of the polity on such issues, because there are at least two different majority coalitions: One forms around the position that a majority holds on the best equilibrium; the other forms around the position a majority holds on the appropriate limit. Person A and Person B disagree. Why do they disagree? Do they want the same thing, but one or both people are making a mistake in reasoning due to a lack of information or understanding? Do they want different, incompatible things in conflict with one another and at most one of them can get what they want? Can they even agree on what they disagree about (goal or solution/process), or is one or both of them convinced that the other is being deceitful in their arguments and reasoning? Mistake theories are best suited to the task of avoiding negative-sum conflicts. Conflict theories are best suited to the task of winning zero-sum conflicts.